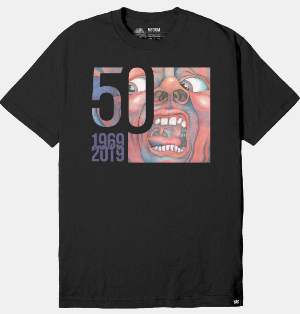 In celebration of King Crimson's 50th Anniversary, this is the first limited-edition design tee, in a series of 12. Being the first, it of course is a derivation of the iconic screaming face design from In The Court of the Crimson King. Printed on a cotton, Hanes Beefy Tee. A reduced price of $25.00 automatically applies for Frequent Fliers and members of the Schizoid Club. For inquiries about this free club, please contact us at orders@schizoidshop.com.